We are aware that recent media attention regarding pollinator health has focused on neonicotinoid insecticides and their potential impact on bees. Many of these stories provide important information for the green industry to consider and reflect upon, while others represent overstated perspectives with the intention of driving a zero-pesticide-tolerance agenda. Research and peer-reviewed publications from trusted and legitimate sources, including those from the United States Department of Agriculture and the Environmental Protection Agency, strongly contradict the finger-pointing at neonicotinoids. 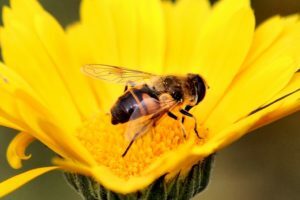 Rather, the research suggests that “colony collapse disorder” of managed hives is likely caused by a combination of factors, including the destructive Varroa mite (first found in 1987), bee pathogens, loss of habitat and forage, and the constant stress of transporting hives to far-off locations by beekeepers. Pesticides may play some role in the concerns about pollinator health but are likely to be one relatively small factor in a complex array of challenges. Horticulture is the original green industry, and in that spirit, there are steps we can take to be part of the solution and to help encourage healthier pollinator communities. We can be smarter in how, when, and even where we apply insecticides and as an industry, we are well-suited to help in creating more habitat and forage opportunities for pollinators. Furthermore, responding proactively will help us preserve insecticide tools that are critical to plant production and pest management, and provide healthier plants and better enjoyment by consumers. Developing a bee and pollinator stewardship program that improves the circumstances surrounding pollinator health concerns. Funding research that will help us answer key scientific questions that support the stewardship program. Spreading the word to our horticulture industry communities and our customers how the program has a positive impact on pollinators and still allows us to mitigate the spread of invasive pests that threaten our natural environment. In addition, financially supporting this initiative now, you will have other opportunities to embrace bee and pollinator stewardship and help spread the word as the initiative produces results. This initiative is in partnership with SAF, AmericanHort and the Horticultural Research Institute. Together, we are committed to working together to assure that this is an all-industry effort. Why should you consider marketing your plants as bee-friendly? AFE is funding a two-year project to examine the health of honey bees on ornamental plants following treatment with neonicotinoids and other systemic insecticides. Titled, “The Impact and Residual Activity of Systemic Insecticides in Ornamental Plants,” Clemson University researchers J.C. Chong, Steven Klaine and Jennifer Tsuruda will document the translocation of systemic insecticides, including neonicotinoids, to various plant parts.